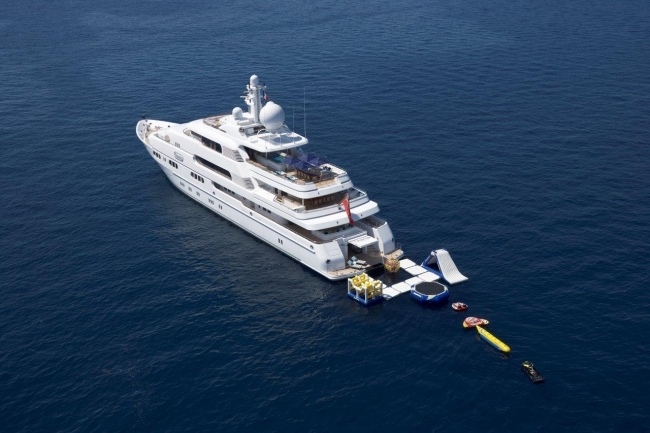 Mega Yacht TITANIA is still available for a Christmas/New Year charter in the Maldives or Seychelles and will remain available there until March/April 2013. • New beach club with sauna convertible into Night Club. • Fully equipped air-conditioned sun deck gym with fitness instructor. • Health spa with CACI treatments and massage facilities. • New second master suite installed on the upper deck with panoramic sea view. • Garage full of toys. 1st Master Suite on main deck forward (130m2) with private jacuzzi. 2nd Master Suite on upper deck forward with panoramic view. VIP cabin on Bridge Deck.